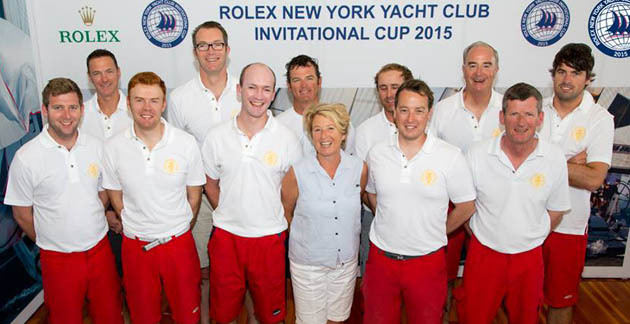 The Royal Cork Squad at he Rolex NYYC New York Invitational 2015. Photo Corinna Halloran Media. In the most competitive Rolex NYYC Invitational series to date it turned out in the final analysis to be a battle between the old rivals Britain represented by the Royal Thames Yacht Club and the New York Yacht Club representing the United States. 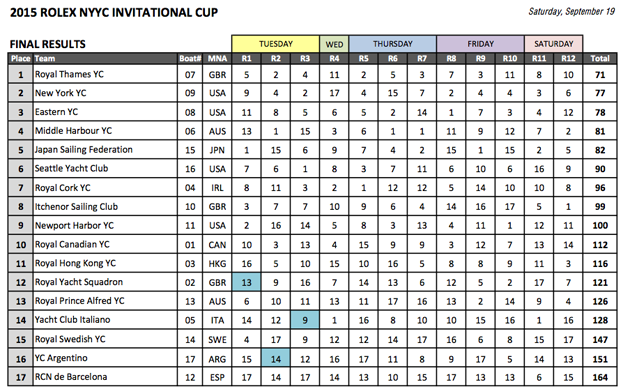 It was an event in which the American teams were growing in strength as the event progressed and this was evidenced by the score sheets. However, in the end the Royal Thames did enough to hang in there and take the result for Britain. As mentioned earlier during the reporting of the event, it was likely to be a game of snakes and ladders and so it was with even the Canadian defending champions from the previous two editions of the event sliding to tenth position at the conclusion and neither the first nor second placed teams having won a race. It was a worthwhile event for each and every team present and as there can be only one winner we offer our heartiest congratulations to the Royal Thames Yacht Club.